Explore hidden gems such as Wertheim National Wildlife Refuge and Great Neck Steppingstone Park. Take a break from the city and head to Ocean Grove Beach and Henry Hudson Trail. There's still lots to do: explore the world behind art at The Metropolitan Museum of Art and wander the streets of Times Square. To see where to stay, maps, and other tourist information, refer to the New York City online holiday maker . Bucharest, Romania to New York City is an approximately 16-hour combination of flight and bus. You can also fly; or do a combination of flight and train. Traveling from Bucharest to New York City, you'll gain 7 hours due to the time zone difference. Traveling from Bucharest in October, things will get a bit warmer in New York City: highs are around 24°C and lows about 16°C. Finish your sightseeing early on the 16th (Fri) so you can travel to Washington DC. Discover out-of-the-way places like Skyline Drive and Harpers Ferry National Historical Park. 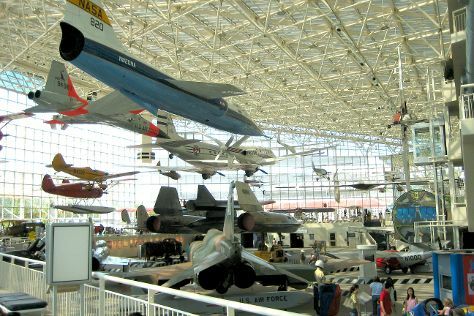 Let the collections at National Air and Space Museum and National Gallery of Art capture your imagination. Step out of Washington DC to go to Cambridge and see Blackwater National Wildlife Refuge, which is approximately 1h 40 min away. Next up on the itinerary: appreciate the history behind Vietnam Veterans Memorial and admire the masterpieces at National Portrait Gallery. To find reviews, other places to visit, maps, and tourist information, read Washington DC road trip site . Fly from New York City to Washington DC in 3.5 hours. Alternatively, you can take a train; or drive. In October, daily temperatures in Washington DC can reach 25°C, while at night they dip to 14°C. Wrap up your sightseeing on the 19th (Mon) early enough to travel to San Francisco. Your day-by-day itinerary now includes Marshall’s Beach, USS Pampanito and Dolphin & Whale Watching. On the 14th (Wed), kick back and relax at Marshall’s Beach, then snap pictures at Golden Gate Bridge, then step off the mainland to explore Alcatraz Island, and finally go for a walk through Fisherman's Wharf. Get ready for a full day of sightseeing on the 15th (Thu): see majestic marine mammals with a dolphin and whale watching tour and then learn about all things military at USS Pampanito. To see photos, where to stay, maps, and more tourist information, go to the San Francisco day trip app . Traveling by flight from Seattle to San Francisco takes 4.5 hours. Alternatively, you can do a combination of flight and train; or drive. Expect somewhat warmer temperatures when traveling from Seattle in October; daily highs in San Francisco reach 26°C and lows reach 15°C. Wrap up your sightseeing on the 15th (Thu) early enough to travel to Washington DC. Your day-by-day itinerary now includes Space Needle as well as Snoqualmie Falls. Start off your visit on the 22nd (Thu): kick back and relax at Alki Beach, then get engrossed in the history at Museum of History & Industry, and then don't miss a visit to Space Needle. Here are some ideas for day two: do a tasting at Chateau Ste. Michelle Vineyards, then get a taste of the local shopping with Bellevue Square, and then trek along Snoqualmie Falls. To find maps, ratings, other places to visit, and other tourist information, read Seattle itinerary app . You can fly from San Francisco to Seattle in 4.5 hours. Other options are to do a combination of train and flight; or drive. In October, Seattle is slightly colder than San Francisco - with highs of 20°C and lows of 11°C. On the 24th (Sat), wrap the sightseeing up by early afternoon so you can travel back home.